Perfect for the beginner & professional alike! 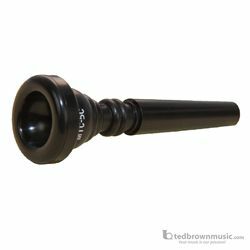 The Mutec Polymer Mouthpieces for trombone are designed as an ideal starting point for any beginning player. These mouthpieces are made from polymers engineered to provide a dimensionally consistent product. The nature of the material produces less fatigue and increases the endurance of the average player. Many players with braces have enjoyed more comfort playing with a Mutec Polymer mouthpiece vs. a traditional silver plated brass mouthpiece. These mouthpieces are ideal for outdoor performance, as they will not conduct heat or cold.